MS-L Precision Balances mean no more compromises between sample size and weighing precision. 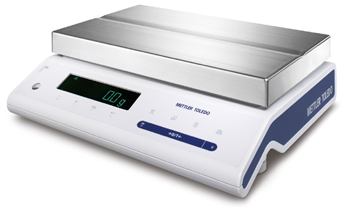 The large weighing platform is very convenient for totalization tasks with larger quantities of ingredients. The High Contrast Display with big numbers, clear symbols and an intuitive menu enables users to operate the MS-L Precision Balances quickly and easily. The tough metal housing and extreme overload protection of more than 100 kg safeguard your balance when working with heavy samples. The large weighing pan provides a stable surface for the weighing of bulky items. For example, the groove in the top of the weighing pan allows cylindrical samples to be placed directly on the balance without the need for an extra container. The weighing pan and balance housing are resistant to the harshest of chemicals, including acetone, and help ensure a long balance lifetime. Surfaces of MS-L Precision Balances are smooth and rounded to make cleaning easy, and save time and effort.